We can put a unique spin on your event! 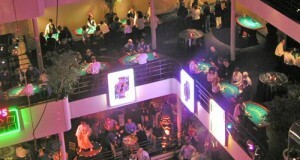 Turn your holiday party, house party, charity event, or graduation event into a casino. Event Magic offers the equipment and the staff. Combine our props and scenery package, and you’ll have a knock-out event that will Wow! your guests! 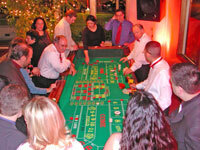 Event Magic offers authentic blackjack, casino-sized craps and roulette tables. We also carry a money wheel to add to the selection. Our service includes a raffle drum and tickets to make the night fun and interesting. 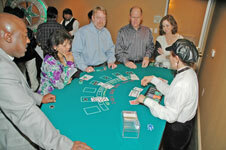 We can help you stage the perfect poker tournament with games like Texas Hold ‘Em and poker. We offer the perfect combination for casino night fundraisers. Add a sound system, unique decor and our signature Las Vegas style props, and you’ll have a knock-out event that will make your event memorable for all of your guests! Call our Casino Events Director Henry Perez, at (510) 434-0406, and reserve your date today. The holidays can book up fast!